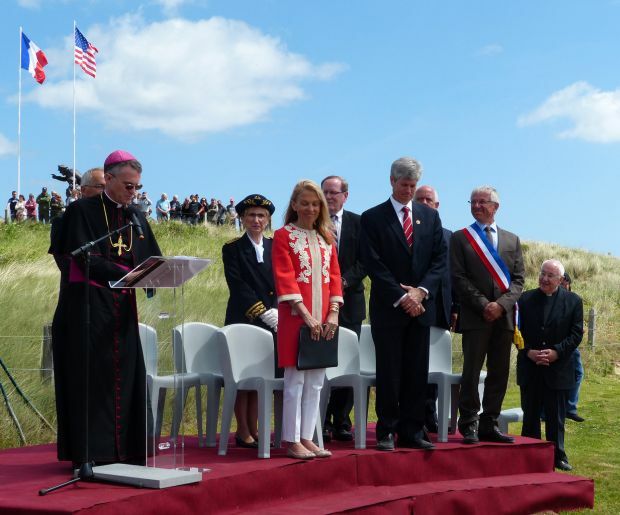 Archbishop Timothy P. Broglio of the U.S. Archdiocese of the Military Services gave the benediction June 6 after the dedication of a new monument on Utah Beach that depicts three American GIs emerging from a Higgins boat. The famous amphibious landing craft, designed by Andrew Jackson Higgins, was used extensively in World War II, including on June 6, 1944, known as D-Day, when the Allies invaded the beaches at Normandy and began the liberation of German-occupied northwestern Europe from Nazi control. The monument is an exact replica of one that stands in Higgins’ hometown of Columbus, Nebraska. It stands on France’s Utah Beach next to the U.S. Naval Memorial in front of the Utah Beach Museum. “Change our power to make war into a force for peace. Change our weapons into plowshares. Give us the ability to negotiate, to talk and to listen,” Archbishop Broglio said. Speakers included U.S. Rep. Jeffrey L. Fortenberry, R-Nebraska; Mayor Mike Moser of Columbus; a grand-nephew of Higgins; Sainte-Marie-du-Mont’s mayor; Timothy Kilvert-Jones, a military historian and retired major in the British Army who came up with the idea for the monument; and, representing the French government, the prefect of La Manche, which is a French department, or geographical region, in Lower Normandy. Archbishop Broglio also attended a commemoration for fallen Danish troops and celebrated a morning Mass June 7 in the historic parish church of the town of Sainte-Mere-Eglise, the first village in Normandy to be liberated by the Americans on D-Day. It was on that church’s steeple that an American paratrooper was left hanging until he could be cut down. Pvt. John M. Steele had landed on the steeple during the invasion. His parachute was caught in one of the pinnacles of the church tower.